The first thing to remember is that everyone's system will be different and that's okay. And also, a system for one person may change after a couple of months or years even if it works well. That's all okay and is very normal. The set appointments happen at a set time like if you have a meeting, it has a start time and an end time. Your routines are the things you do every day - checking email, blogging, client work, laundry, cooking, etc. And the other tasks and projects are things you need to work on at a specific point in time. If you're planning your spouse's birthday party, that happens at one time every year. A good daily plan usually contains all three elements. The key is to add projects and tasks first before you add the routines because the routines usually will get done. It's those other things that never get done unless they're scheduled. Keep a notebook for your master list or running to-do list and a separate place for your daily plan. This could be in a proper spiral-bound or stitched daily planner, or you could just designate a specific blank notebook and use a page every day. Every evening, take a few minutes to plan the next day. When you do your planning, write down any pertinent information. Like if you have to phone the dentist, write "phone dentist Tel: 6164523" so you don't have to hunt around for that information when you're meant to be doing. Add your set appointments with some buffer time for travel. Block out about an hour or two for your daily routines. Since they're routines, I suggest using low-energy time since you probably won't have to think or focus too much. Add in only a few tasks from your master list. These are the tasks that will help you get your projects done or your goals accomplished. Seriously, that's what you do every day. By the end of the week, you'll be able to cross something significant off that never-ending to-do list. I promise you. How do you do your daily plan? Hi Marcia - Great ideas - Love them. I do the running to do list also, on a separate piece of paper. One thing that you didn't mention is the type of planner that you use. I am just curious, but I like the layout of it. Thanks. Upon reflection, I think that I use something like a running schedule with items that are freely moved around throughout the day. I find that better than a to-do list (for me) as it allows me to confront the reality that tasks take time, and it's impossible to make a list that doesn't include that factor and make it work... again, that's just me. 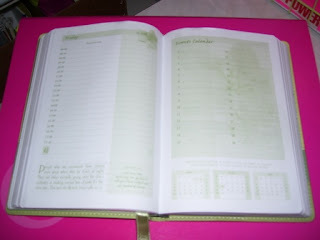 But, I love that you have spent the time to create your own system -- very "Time Mgt 2.0"
Lori, it's a Joyce Meyer planner I bought at Exclusive Books in South Africa. I find a 7 day (each day is a long column) bound in leather day timer works best for me. I think I bought my current one in Border's book store in Illinois. Before that, I found it in a calendar store that would set up shop for a few months (at Christmas)in the local mall. If I just scribble on little pieces of paper- it will get lost- or I can't refer back later. And YES! definitely add the phone number to the task- otherwise you have to hunt allover....It has taken me more than 20 years to get this system working - and I absolutely depend on my day timer!